We celebrate the traditional American Christmas with a large family meal, gift exchange and for us at least, time spent watching Christmas movies and playing in the snow! Bribing the kids with advent calendar chocolate to get ready for school. Im still a teen, and what we have literally always done is gotten, and eaten donuts for breakfast. Literally none of the five of us had any idea why, or how it started, but it’s so great. 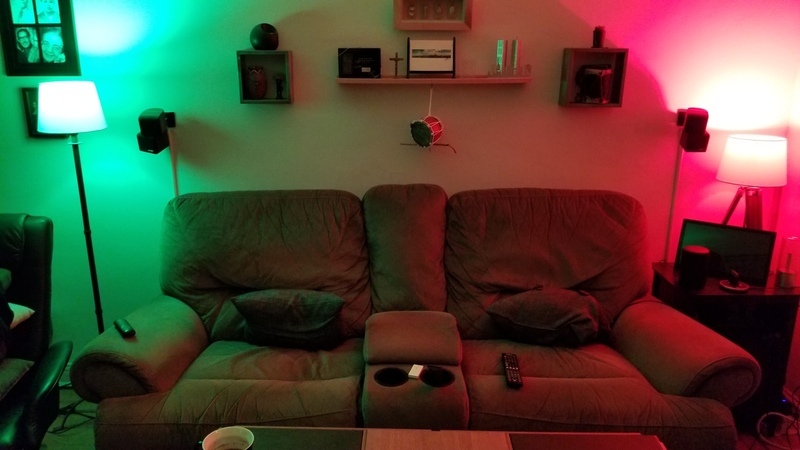 My Christmas tradition is pretty simple and that is just the way I like it. For as long as I can remember my parents and I would go over to my Aunt and Uncle's house on Christmas Eve, there would be a ton of kids, it was madness. But then came Christmas Day and being an only child my parents usually let me sleep in if I could, because the same Aunt, uncle, and cousins would come over our house for a nice, small, Christmas dinner. Then we would check out what each other got for Christmas! Being a kid was great! I'm German, and in most German Families (That live in America) we open our presents on Christmas Eve because the time in Germany would be morning to afternoon, while it is still night in America. When we were very young my brother and I exchanged gifts. But we both liked the same things. So typically we would go to the store together, buy our gifts, and later exchange them We gave up on acting surprised. So, my mother has 6 siblings. Her mother had 12 siblings. Imagine gathering the whole extended family into the same space for Christmas Eve. Over 100 people present, and talks of the other 100 who couldn't be there. An insurmountable amount of food. I'm pretty sure every year I was introduced to a new cousin, as well as to three or four cousins I've been introduced to before. There are too many cousins to count, let alone to know by name. And that's just the setting. Somewhere around the night gifts would be distributed - mainly to kids and teens, or we would be there until after new year's. My grandma would be Santa, in a cheap costume and a plastic mask. And there was a Secret Santa. Not once I was the Secret Santa of someone I previously knew - not that it mattered, all gifts were bought by my mother in a completely generic and non-personal fashion. One occasion, someone convinced the whole group to play what we call "cordless phone" in Brazil - basically, one person tells someone else a sentence, and it must be passed person to person until the end, with comically variations occurring along the way. This was extreme cordless phone, and at some point someone would take the opportunity to wish merry Christmas to the person receiving the message, and the wishes would be mixed in the original message, which ended up completely lost by the end. As a shy kid just willing for a nice intimate Christmas, this was not a good party. But if you search Brazilian Christmas traditions on Google, you are likely to find the custom of mixing dried grapes in the rice. Why dried grapes on Christmas? No one knows. Why only on Christmas? No one knows. Some people like it, some don't mind it, but some dread it, and those are the most loud ones. Every year, around this time, the "dried grapes or no dried grapes" discussion starts. I like your story a lot, Tiago! To help prevent from having an empty tree til Christmas, we will put out a few presents every couple of days til Christmas. this way the kids will get the excitement of seeing the tree becoming fuller as well as getting to guess their presents. We save the best for last. In Latin America extended families open presents both on Christmas eve and Christmas morning. The presents from relatives are opened Christmas Eve, while the presents opened Christmas morning are from baby Jesus. Although you do see quite a bit of SantaClaus he’s not the one giving the presents here. Every year, around this time, the "dried grapes or no dried grapes" discussion starts. 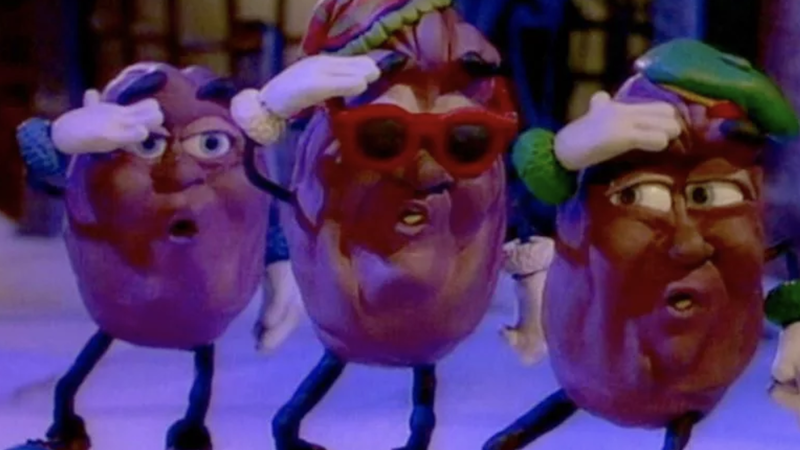 The "We Three Kings" segment from Will Vinton's Claymation Christmas is still one of my favorites. I've always loved when the camels break in to their R&B-style chorus. We celebrate Christmas on Christmas Eve, December 24. Food, drinks, Christmas music until the clock strikes 12AM and than we hand out gifts & open them. That's been our tradition since I was a kid. Watching Santa break all laws of physics. But that's fine its for kids who don't know physics. I'm originally Portuguese so we have some nice traditions that we do every year for Christmas. As a child we would always start putting our Christmas tree up on the 19th of November as it's my dad's birthday and we had a huge tree, so big that it would reach the sealing and he had to go up on chairs to try and put everything up, so as you can imagen it would take quite a few days to finish setting it all up. 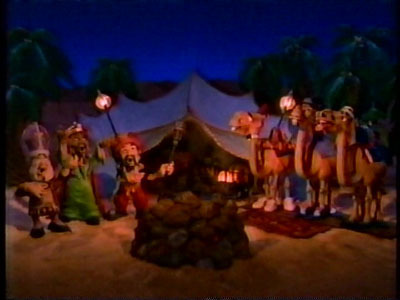 We would also always set up a nativity scene. By Christmas Eve my mum and Nan would always make the Portuguese traditional Christmas pastries. (Which I will leave a photo below for you guys to see what they are like). We would always have a big table full of those lovely pastries. We also have a very traditional Christmas cake called "Bolo Rei", in I'm glad that mean the king cake. (1st photo shows this cake). All the family would get together and we would then celebrate Christmas and have our Christmas dinner on Christmas Eve. Then me and my brother were sent to bed at around 09, 10pm so that Santa could come to deliver the presents and then my dad would wake us up at midnight when it was Christmas day and we would open all our presents. Then we would spend all Christmas day playing with our new presents. 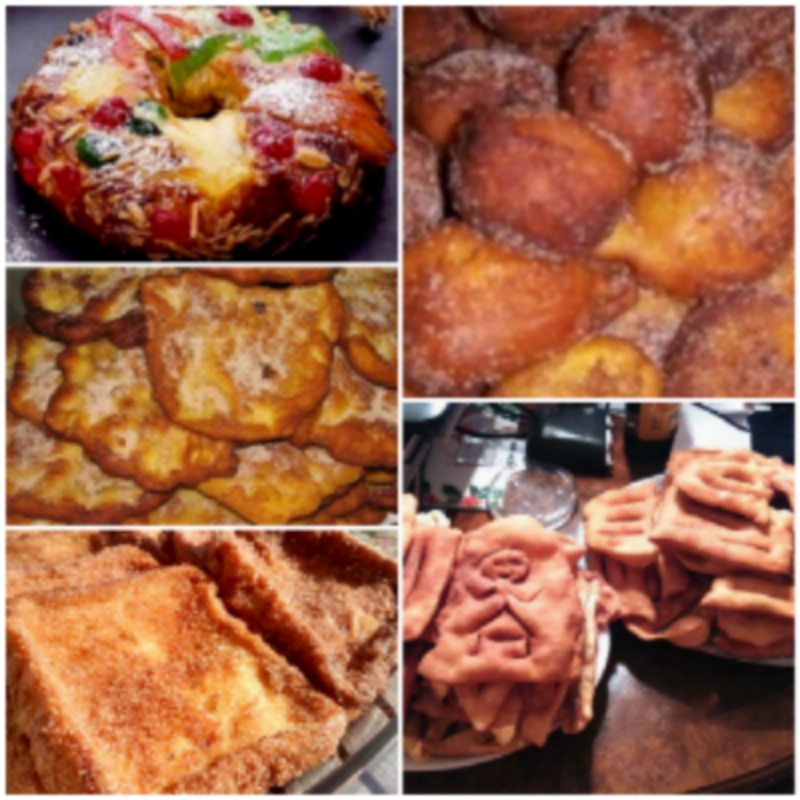 Now as an adult I bake the traditional Portuguese pastries every year and we still do open the presents at midnight. Oh and we still have our traditional nativity scene and Christmas tree put up like the old times. Congrats to the winner!! Happy Holidays!! We really didn't have any "real" traditions, just ur normal 1 present opened on Christmas Eve and leaving milk & cookies out for Santa. But now that our boys are 19 & 23, we have started a tradition of just the 4 of us getting away on the 23rd & just the 4 of us spending as much time together as possible. They have busy lives with school, work, & friends so we know our yrs with them at home are limited so we want as much time with them as we can steal.. Happy Holidays to Everyone!!! It seems like Christmas is more for the couples than family holiday in Korea. A lot of people spend the day with their partner rather than the family. However, our family always celebrated by having Christmas dinner on the eve of Christmas together. My parents would invite over my sister's boyfriend and my girlfriend over as well(if we had one at the time) so we can have family dinner together.